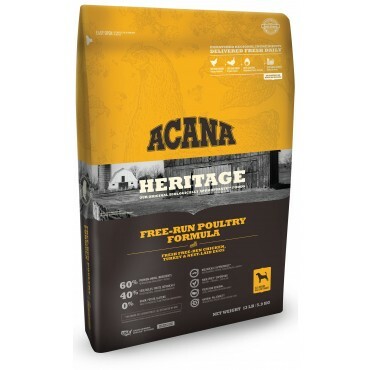 A great all around dog food for dogs of all life stages, ACANA Heritage Free-Run Poultry delivers dog nutrition at its best. With a rich level of protein and 60% premium animal ingredients, ACANA Free-Run Poultry suits dogs that do well with or enjoy chicken and turkey. Along with free-run poultry this dog food also features organs and cartilage that not only mirror the diet from your dog's evolution, but also provides nutrients naturally without synthetic additives. In essence the inclusion of whole-prey ratios in this food means that you will be feeding your dog muscle meat that provides protein for energy and cell replenishment; giblets that suppy protein, iron & zinc, liver that supply B vitamins and minerals such as iron & zinc which both play a role in immune system function, and cartilage that provides amino acids that helps support healthy bones, skin, coat, immune system and digestive function. Because of this, we believe that ACANA Free-Run Poultry is one of the best moderately-priced dry dog foods in the market. Optimal Nutritional Balance for Peak Health - ACANA Heritage Free-Run Poultry is loaded with 60% premium meat ingredients, including chicken, turkey and catfish. This variety of animal protein helps provide the essential amino acids, vitamins and minerals that are needed for your dog's peak health. Because your dog cannot get all of his/her essential nutitients from one protein source, the diversity of meats in ACANA Free-Run Poultry dog food provides the optimal nutritional balance that your dog needs. Builds Lean Muscle Mass – Instead of pea or potato protein concentrates, ACANA Heritage Free-Run Poultry derives its protein content from animal ingredients. This animal meat content helps your dog maintain lean muscle mass. Lean muscle mass is not only good for building strength and burning calories more efficiently, but it also is beneficial for your dog's long-term health. Helps Maintain A Healthy Weight - Because ACANA Heritage Free-Run Poultry limits carbohydrates and replaces fast carbohydrates (rice, potato and tapioca) ,which are recognized as leading causes of obesity and diabetes, with low-glycemic, locally grown vegetables and fruits, this helps maintain healthy blood sugar levels and reduces the potential for fat storage. This is all great for maintaining a healthy body weight because a healthy weight translates to a longer life for your dog and it helps prevents certain medical conditions. No Undesirable Ingredients That Would Harm Your Dog - ACANA uses actual food ingredients to provide all required nutrients; that is, since ACANA Free-Run Poultry features the meat in whole prey ratios, essential nutrients, vitamins & minerals are provided through this rich diversity of meats, liver, giblets and cartilage. Thus, this eliminates the need for a long list of synthetic ingredients. The only supplement that ACANA has added is zinc. ACANA's Free-Run Poultry features an unmatched variety of local ingredients that are raised or fished by people they know & trust, come from federally inspected facilities and then delivered to their DogStar® kitchens fresh each day. First 5 Ingredients - These are the main ingredients that make up the bulk of the dog food. Zinc - An essential mineral that helps support a healthy immune systm, helps support a healthy liver, helps with protein & carbohydrate metabolism and helps the skin function and with wound healing. Mixed Tocopherols – A natural preservative that works to keeps dog food from turning rancid and losing its nutritional value. Unlike artificial preservatives which has had suspected health issues and is a synthetic additive, mixed tocopherols are a family of Vitamin E that are naturally found in fish and leafy green vegetables. Chicory root - The root from a woody plant that supports digestive health, prevents bacterial infections, protects the liver, boost the immune system, provides dietary fiber and relieves arthritis pain due to its anti-inflammatory properties. Tumeric - A spice that contains compounds with medicinal properties. Tumeric helps fight inflammation, increases antioxidants that fight disease, helps improve brain function, lowers heart disease and helps prevent cancer. Sarsaparilla root - A root from a woody plant that protects the liver, has natutal detoxifying properties, alleviates skin problems, helps prevent cancer, reduces inflammation and boosts the immune system. Althea root - A root of a plant known as the marshmallow plant that helps fight bacterial infections, improves digestion, lowers inflammation and heals skin conditions. Rosehips - The fruit of the rose plant that is one of the best source of Viatmin C, which helps treat infections and boosts the immune system. Rosehips also helps prevents diseases such as cancer, increases circulation, regulates digestion, reduces the symptons of arthritis, treats inflammation and enhances skin and bone health. Juniper berries - Seed cones from the juniper plant and are used as a bitter spice. Juniper berries contain great antioxidant potential and thus, may help prevent diseases such as cancer. They help improve skin conditions, may improve digestion and can help improve heart function. Dried lactobacillus acidophilus fermentation product - used as a probiotic. Probiotics are live microorganisms that help promote a healthy digestive tract and a healthy immune system. Known as “good bacteria,” probiotics promotes healthy digestion and helps balance the good and bad bacteria in the intestines. Dried bifidobacterium animalis fermentation product- used as a probiotic. Probiotics are live microorganisms that help promote a healthy digestive tract and a healthy immune system. Known as “good bacteria,” probiotics promotes healthy digestion and helps balance the good and bad bacteria in the intestines. Dried lactobacillus casei fermentation product.- used as a probiotic. Probiotics are live microorganisms that help promote a healthy digestive tract and a healthy immune system. Known as “good bacteria,” probiotics promotes healthy digestion and helps balance the good and bad bacteria in the intestines. 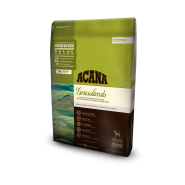 Our Dogs LOVE Acana Review by Miles & Rex APPROVE!